Almost all sufficiently advanced websites these days use RSS — Really Simple Syndication — to keep you notified of the latest information posted on the site. If you’ve never used an RSS feed — or if you use RSS but don’t know how it works — you’re in for a pleasant surprise. RSS feeds bring information to you. Instead of making you scour the Web, checking on the latest and greatest news, most established websitesfeed you short synopses of what they posted. It’s hard to draw an accurate analogy for RSS feeds, but I like to compare them to a magazine display rack: the front covers of most magazines feature a handful (maybe two handfuls) of short descriptions referring to the content inside. Most of the time, you can glance at the cover of a magazine and tell, more or less, whether it contains anything that interests you. When you look at a rack of magazines, you’re looking at the distilled contents of dozens or even hundreds of publications. In the course of a few minutes, you can tell from a lot of covers what’s worth a second look. Now imagine your own personal magazine rack, where you get to choose from the magazines on display. More than that, imagine a rack with rapidly updated content — with the magazine covers announcing the changes. That, to me, is the essence of RSS feeds. Each website publishes a list of its headlines. Your news reader retrieves those headlines every minute or two and then displays them to you. If you see something you like, click on it, and your browser goes to the article that you clicked. 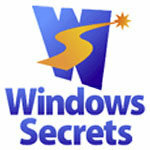 Windows Secrets RSS, windows secrets, Windows Secrets newsletter. permalink.